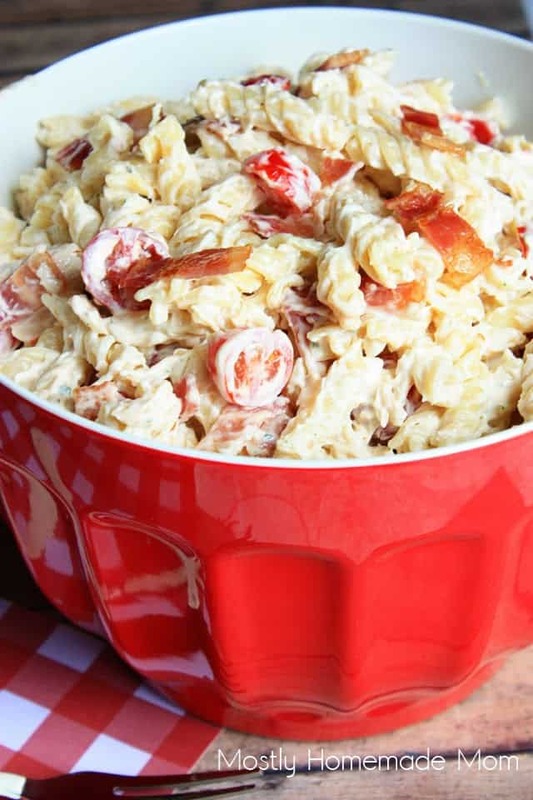 This Bacon Ranch Pasta Salad uses rotini pasta tossed in a ranch sauce along with chicken, cherry tomatoes, and bacon – the perfect side dish to your next picnic or BBQ! I’ve always been a pasta salad fanatic. I know usually with the guys, the grilled meats are the hit, but in our family the girls tend to gravitate towards the salads! 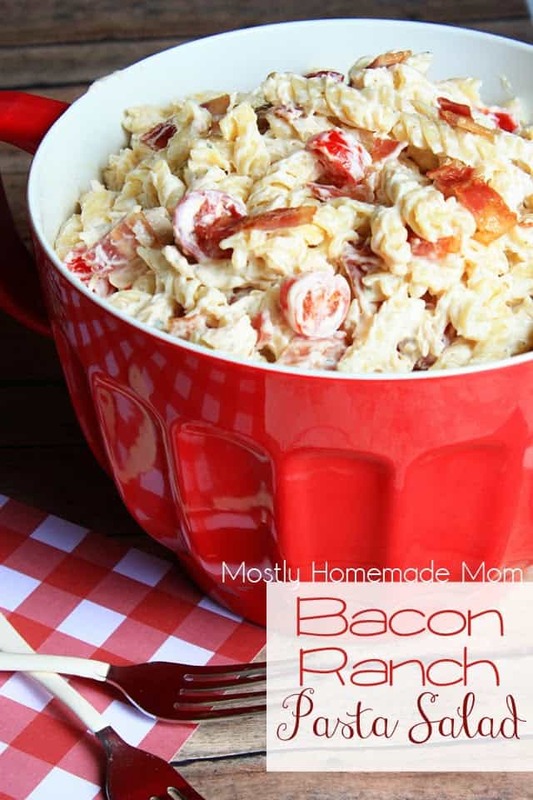 And I can guarantee, this Bacon Ranch Pasta Salad recipe is the best of the best! My mom has always made a KILLER potato salad, one that no one would even attempt to top or recreate. But I have to say over the years, we’ve tried various different versions of pasta salad and all were… meh. 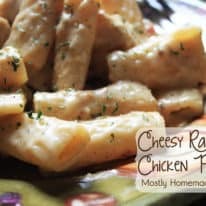 NO need to look any further when this recipe is available right here! Crumbled bacon, chicken, tomatoes, and ranch seasoning – what more add ins could you ask for?? But really, feel free to add peas, chopped peppers, and even cubed cheese to this pasta salad to take it over the top for your family! The recipe is right below with instructions on how to pull together this fabulous pasta salad, but make sure you rinse the cooked pasta well with COLD water to stop the cooking process and prevent mushy noodles. For best flavor, give this salad a few hours in the fridge for the flavors to combine well! If you liked this Bacon Ranch Pasta Salad recipe, please leave a rating and a comment at the bottom of this post! 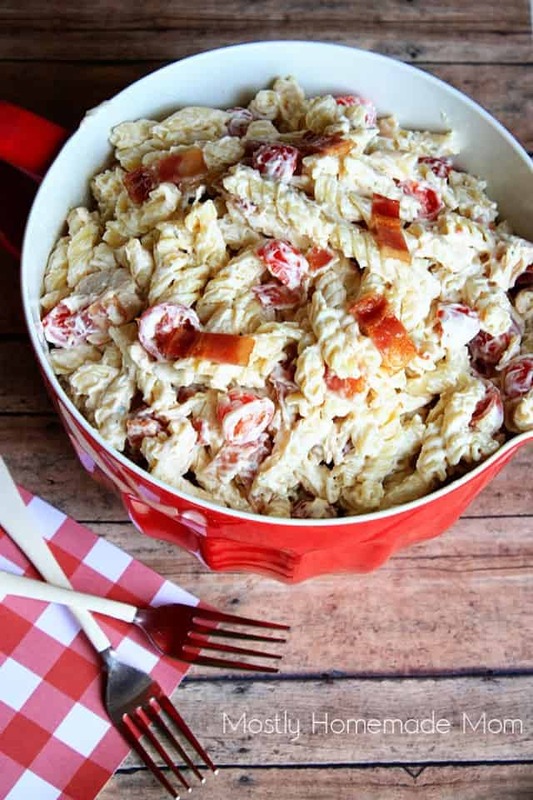 This bacon ranch pasta salad has rotini pasta tossed in a ranch sauce along with chicken, cherry tomatoes, and bacon - the perfect side dish to your next picnic or BBQ! Cook pasta according to package directions, drain, and rinse under cold water. 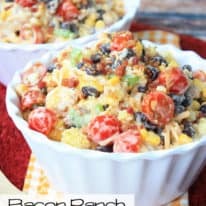 In a separate bowl, mix together bacon, mayo, ranch dressing mix, tomatoes, and chicken. Pour over pasta in a large mixing bowl and mix well. Keep refrigerated before serving. 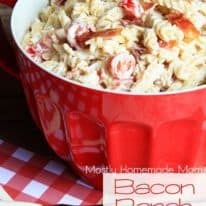 I can guarantee that this Bacon Ranch Pasta Salad will become a HIT at our next weekend BBQ together! The bacon and the tomato really POP with flavor against the pasta and ranch sauce. And the chicken just takes it over the top. You really have to try this! We ALWAYS have leftover coffee in the pot. I'm going to make this tonight when I give my son his ice cream. Thanks for the awesome idea! Wonderful dish! I did add a little onion and more bacon as my husband doesn’t like chicken. I used a whole package of bacon. It was so yummy we both had seconds. Ate it warm also but know it will be good chilled too. I’m so glad you and your husband enjoyed this pasta salad, Mary! I’m planning on making some this weekend for our Memorial Day cookout. Have a wonderful day!